Catch the United States Air Force Parachute Team âWings of Blueâ at the Truckee Tahoe AirShow. 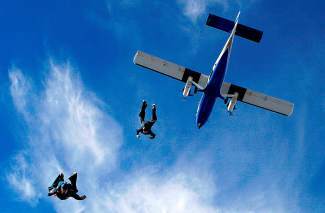 When: Saturday, July 12, 8 a.m.-5 p.m.
TAHOE/TRUCKEE, Calif. — The United States Air Force Parachute Team “Wings of Blue” will mesmerize the crowd with aerial skills, flags and color-filled smoke grenades at the Truckee Tahoe AirShow on July 12. The team’s precise performance features jumpers who fly streamers, smoke canisters and carry game balls. A massive 800-square-foot American flag flies to open air shows and professional sporting events such as the Rose Bowl, NFL and MLB games. They also open for all Air Force Academy sporting events. In addition, “Wings of Blue” has appeared on the international scene performing in Chile, Japan, Spain and the United Kingdom. Each “Wings of Blue” demonstration team is composed of highly qualified United States Air Force Academy Cadet jumpers and the 98th Flying Training Squadron. Team members are hand-selected based on their abilities to represent the Air Force Academy and the Armed Forces. They receive abundant training on free-fall and canopy flying, smoke systems, flag systems and formation flying maneuvers. Additionally, “Wings of Blue” members train rigorously to accurately land on target at the show venue. The AirShow will feature National Hall of Famer Patty Wagstaff; Showmanship Award winner and Jelly Belly sponsored Kent Pietsch along with world-renowned performers Dan Buchannan, Jon Melby, the RedStar Formation Team and The OV-10 Bronco flying performance. Festival activities will include a Vendor Village, static aircraft displays with pilot docents, a Kids’ Zone and a food and beer garden. More details and newly committed attractions can be found at http://www.truckeetahoeairshow.com. On Friday, July 11, the pre-event Honorary Dinner will feature a “teaser” air show from “Wings of Blue” and highlighted aerobatic performers Kent Pietsch, Dan Buchanan and the Patty Wagstaff. Keynote Speaker Wagstaff, a six-time recipient of the “First Lady of Aerobatics” Betty Skelton Award will address guests with a presentation on women in aviation. The evening will also include a catered dinner by Mountain Magic Catering, a silent auction by the Nevada County Sheriff’s Search and Rescue, a no-host bar, live music and much more. Dinner cost is $50 per person. Tickets go on sale May 12 at the Truckee Tahoe Airport or online at http://www.truckeetahoeairshow.com. Major sponsors to date include Truckee Tahoe Airport District, Tahoe Mountain Resorts Foundation, Suddenlink, Sierra Sun and The Weekly. The Truckee Tahoe Airport District is the “Golden Wings” sponsor of the 2014 TTAS&FF fundraising event, funding all operational costs associated with the event as a gift to its community. Three nonprofit organizations and their volunteers make the event come to life while raising money for children’s scholarships and various programs. All proceeds from sponsorships, vendor fees, pre-event dinner ticket sales and food and beverage sales go directly to local youth. The three nonprofit organizations include The Experimental Aircraft Association (EAA) local Chapter 1073, KidZone Museum and the Truckee Optimist Club. For more information and updates about the 2014 Truckee Tahoe AirShow & Family Festival visit http://www.truckeetahoeairshow.com and follow on Facebook at http://www.facebook.com/truckeetahoeairshow.